A guest post from my brother Jonathan, an Anglican priest out in rural Sasquatchenon. You can find him blogging over at his parish’s blog as swiftcurrentparishrector. The stories of the people who are joined in the ancient practices today are as vital as the teachings of ages past. I asked him to write a post about his experience praying the office four times a day, which he said kept him running on a ‘more even keel’. When Matthew first approached me and asked me to contribute to his blog, I wondered what I would have to add that has not already been said. The Lord has moved me to accept that my voice – another voice than just Matthew’s – is contribution enough. If all content is repetitive; if all insight is un-sight; if my words come across to you, the reader, as less-than-inspiring; yet, you will know that there is another who considers regular prayer a valuable discipline. For all the words that may be written, if I can bring glory to God, and not to myself through some sharp wordplay or self-aggrandizement – if I can simply present the truth of my walk, and having done that to stand… that is enough. I have been an ordered deacon of the Church for eleven years; an ordered priest for ten and a half of those. Morning and Evening Prayer have been a regular part of my life for that time – though at times a more regular part than at others. They were certainly a part of my daily discipline for the three years prior to Christ’s reception of me among the holy orders of His Church, while I was in seminary. Even for two (or so) years prior to that, when I first began to step into responsible Christian leadership – which I was sometimes more responsible with, sometimes less. Sixteen years is a short time, and I am no master of daily office prayer. Certainly I can navigate a few good prayer books. I can handle the lectionary charts printed in obscure locations throughout them. But there have certainly been times my mind has wandered while I’ve been in prayer; there have certainly been times when I’ve found it difficult to find the words to pray (even when they’ve been printed on the page in front of me!) through my own weakness. There have also been times when I’ve been powerful in prayer, when the devil has fled before me (because of Him in whom I stand), when the world has fallen away and God has granted me the serenity of stillness with Him – when I have been granted the grace to know not just that He is God, but to know Him as He is. As the Greeks say, God grants the grace of the discipline of prayer to those who pray. As the English say, Lex Orandi Lex Credendi Lex Vivendi. My first foray into daily office prayer began with the 1962 Canadian Prayer book. A book of beauty and vision, a book of wisdom and Word. At first I would seek the counsel of my father, in searching the lectionary and the psalter. I found the prayers deep, uniting the words of Scripture from scattered and diverse locations into beautiful phrases and meaningfully complete thoughts on broad topics. Still, I was not “of” the prayer book, nor “of” Scripture (in that same sense), and so I searched for other meaningful prayers to supplement my usage with. I devised a series of dedications of my fleshly faculties to God, to be used each day: my eyes, to see and understand; my ears, to hear and know; my hands, to do what He willed; my feet, to go where He led; my mind, to perceive and discern; my lips, to speak Life. I employed the Mid-day prayers of the prayer book, for Mission and Ministry, and added to them various topically related prayers from elsewhere in the book. I had names of missionaries and missionary societies that I cycled through each week, with these prayers. I always used the option to the Nunc at Evening Prayer, knowing that I would arrive at it by Compline. In seminary we were challenged to pray the daily offices in community. This was foreign to my practise. We alternated months from the BCP to the BAS ([Book of Alternative Services, the Anglican Church of Canada’s modern liturgy]. I found it difficult to show up during BAS months (though I generally did). I had met an incredible retired priest during a pastoral internship in the summer before seminary, Fr. Robert Lumley. He wrote a book entitled “Finnegan’s Prayer Book” – a fascinating read, though I imagine it is very difficult to get hold of. He would take me out in his yacht, and we would anchor in the middle of the lake, and we would read the psalter together, and pray. I missed that, in seminary. My consolation was that any month, any day, my fellow seminarians were up for going to the chapel for un-officially-sanctioned Compline. But I learned to use and appreciate the BAS at that time, and I still can do so. As a clergyman, my preference and usual use has been with the 1962 BCP. Except while I served at Holy Trinity Church in Calgary, where Stephen Hambidge and I would gather together on weekdays for Morning Prayer – alternating weekly which of us led the prayers, his week BAS, mine BCP – this standard has held true. My experience has shown me that if I am not praying, I am not inclined to pray. If I am praying, then I am inclined to pray. In many ways, it seems to come down to the orientation of my life. These things move in concert – my prayer life and participation in praying the daily offices is not dictated by the way life is going, any more than the way my life is going is directed by my prayer life and participation in praying the daily offices. Nor less so. What Matthew has really asked me to write about, then, is this: recently I have begun to pray four offices a day, rather than the standard two. Why? Every now and then I pull out an illustration which has particular resonance with me (whatever value it may or may not have to my congregations). Perhaps you remember the toothpaste commercial that contained the tag line: “…helps you maintain a dentist-clean at home!” Consider that vision for your dental health. Dentist-clean. Not just when you’re walking out of the dental office after a cleaning, but all the time in-between, leading up to your next visit. Wouldn’t that be… awesome? I’ve heard too many stories of hygienists who were disgusted by the mouths they’ve had to stick their hands into, to think that it doesn’t matter. My tooth-cleaning routine involves rinsing, flossing, rinsing, brushing my wisdom teeth (end-tuft toothbrush), brushing my teeth (regular toothbrush, though gum massagers beside the bristles are a preference, and wedge-shaped bristles at the tip are a plus), brushing my tongue, rinsing with fluoride, scraping my tongue. Extreme? I suppose. But the hygienists aren’t concerned about putting their hands in my mouth. And they don’t find much that needs cleaning. How much more, as God’s people, should we devote ourselves to spiritual growth – to the process of maturation whereby we move from being spiritual infants to being saints? If baptismal vows involve commitment to arriving at the fullness of the stature of Christ (which, I don’t know about yours – but mine sure do! ), then why would we placate ourselves with barely moving beyond conversion? Have I been gathering to worship God in the company of His faithful people for thirty years, or have I only gathered with them once – and been doing it every Sunday for the last thirty years? Yet how many of us content ourselves with the idea that Sunday worship refills us spiritually for what has been drained over the past week? When the means for maintaining a dentist-clean at home are available, why would I let my teeth rot the entire time between dental visits? Similarly, when the means for growing in love and grace with God and humanity is available, why would I expect to simply maintain the level I am at through such infrequent worship as once a week? Even occasionally supplemented by a weekend retreat that “boosts” the level of status quo, why would I be content with this? My point is this: we all know that spiritual formation is a long, gruelling work that is not likely to be completed in this life (though the Wesley’s believed it could, and the witness to some of the Orthodox hesychasts is that it was); we also know that spiritual formation is not something that we’re particularly good at (tell me otherwise, and you stand self-condemned). Why, then, would we put off for tomorrow what we could do today? Why would we hesitate to push forward towards the fullness of the realization of God’s grace and the Spirit’s fruit and gifts in our lives? Love of the world? Love of reputation? At the time of writing this, I have been contemplating a move from four to seven daily offices. We must move as the Lord grants us grace to move – otherwise discipline, because in our own strength, can be destructive. What difference has the move to four offices, from two, made for me? I find my days are structured in a more fruitful way, to encourage the development of faithful (and faith-filled!) trust in God. Morning and Evening are rather ambiguous. They are am and pm. Those are twelve hour blocks each day. But when broken by Mid-day, and expectant of Compline, and attempting to keep them at some kind of equidistant time-spread from each other – these four provide necessary structure that keeps my heart ever-near to His. These four create the contextual space in which I abide in Him, and He in me. And Sunday worship doesn’t refill what has been depleted throughout the week – every time dedicated to prayer is a time of growth. Subtle growth. And that’s enough. Re-post from elsewhere in 2008. Back when I worshipped at St. Alban the Martyr Anglican Church in Ottawa, I went on a retreat for young folks of the “College & Careers” variety. The talks were delivered by the excellent David Alexander on the theme of the Psalms. The Psalms, he reminded us, are prayers. They’re God’s Prayer Book. He recommended praying through the Psalms, saying that we could get through the whole Book of Psalms over two times in a whole year. He also led us through the Psalms, showing us many of the Messianic promises and foreshadowings that were fulfilled in Jesus. I like the idea of praying the Psalms. This is in part related to praying the Gloria Patri — in psalmody, we join with Christians from throughout history, around the globe, and between traditions. The original monastic offices, as practised by the Desert Fathers and then more formalised through Cassian and Benedict, consisted of gathering to pray the Psalms together. 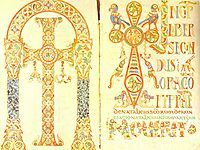 The core of the worship of the monks as they gathered once or twice a week in Egypt or seven times a day in Italy was the Book of Psalms. Eastern Orthodox monks today have a service where they chant all the Psalms of David without stop. Before the liturgies were organised and formalised, before the hymns were written and gathered, the faithful have had the Psalms to sing, worship, and pray with. The Psalms are like an ancient Jewish hymn book. We ought not to neglect them. Nor should we simply read them as we read the rest of the Bible. They were included in the Scriptures not simply because they reveal things about Almighty God but also because they teach us how to pray, aid us in prayer, give us words when we lack our own. Edith Humphrey, in Ecstasy and Intimacy, notes that Evelyn Underhill, a 20th-century English mystic, says that the Psalms and the Gospels are the foundational texts for Christian mysticism and spirituality. The Gloria Patri makes the Psalms part of our prayer. We conclude the lessons with, “The word of the Lord,” or “Here endeth the lesson.” The Gospels when read aloud are closed with, “The Gospel of Christ.” But the Psalms are not concluded in such a manner when we use the Gloria Patri. Instead, they flow into our worship, for they were always intended to be prayers. Through my own praying of the Psalms and reading about the Psalms and the Gloria Patri, I have come to appreciate this ancient practice of making the Psalms one’s own. And now I think I understand my brother‘s dislike of the Psalter as found in the Book of Alternative Services (BAS). The BAS is the Anglican Church of Canada’s modern liturgy and is fast becoming the dominant liturgy in Canada. I grew up with it; it is not as bad as many say. I was nourished by its words and grew into a man of faith using this book at worship every Sunday. Nonetheless, it is a lesser book compared to the BCP. This is one reason why. While it does include the Gloria Patri after the versicles from the Psalms, the Gloria Patri is rendered optional for the actual Psalm of the day. If you turn to the Psalter in said book (pp. 705-909), you will note something following each Psalm: a Psalm prayer. These prayers render the Psalms into little Aesop’s Fables in prayer form. If the Psalm is chiefly a prayer or an act of worship, then a prayer based on the theme of the Psalm at hand or praying for one of the lessons of the Psalm is completely extraneous. I’ve a feeling, though, that the Psalms are not used or understood in this way by many Anglicans. Celebrating Common Prayer, the Society of Saint Francis’ book of the divine office, does the same thing, although it keeps the Gloria Patri with the versicles and canticles. The Psalms are not our own hymns and prayers! They’re just there to teach us a lesson! And if they conflict with our worldview, we’ll just excise the uncomfortable bits from the lectionary. We are to be a people of prayer, drawing from the deep well of Scripture and Tradition. The praying of the Psalms has the benefit of being both. Using the Gloria Patri helps ensure that we continue to pray the Psalms, not simply say the Psalms. O God make speed to save us; O Lord make haste to help us.